(Newser) – A surprise section of bridge gave way, narrowly missing construction workers during Los Angeles' "Son of Carmageddon," but the latest phase of a massive highway reconstruction project otherwise went off without a hitch—and without the predicted nightmare traffic jams. A 10-mile stretch of Interstate 405 had to be closed over the weekend so part of the 50-year-old Mulholland Drive bridge could be taken down to make way for a wider road. 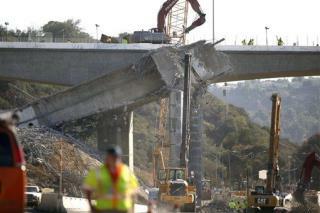 While the crew was working on one section of the span, another section plummeted to the earth, reports CNN. But no one was injured, and LA Mayor Antonio Villaraigosa has already labeled the work a "resounding" success. As Sam Jack eloquently said, "what the f__k" you can't blame China for this one... Made in America by Union workers in California..... A Gov. Jerry Brown special... His only excuse is, he was concentrating on gay rights, and not public safety... "Wake the f__k up" Gov Brown. I can not tell from the story if the writer means that a section of bridge which was scheduled to be demolished unexpectdly fell or if it was a new section that fell. If it was a new section that's embarrassing to say the least. Someone claiming to be a professional is incompetent. The writer or the engineer, you take your pick. Stop patting yourself on the back. I'm sure it was way overpriced , people skimmed money off the top , and it's already outdated. But at least you were able to put some Mexicans to work for pennies on the dollar.